A restructuring undertaken by Brazil’s second largest carrier Gol at the beginning of 2012, underpinned by domestic capacity reductions, bore some fruit in key financial and operational metrics during 2013. But profitability remains elusive for the once high-flying airline as it recorded its third consecutive annual loss in 2013. Gol did shrink its losses in 2013 as rationalising supply with demand within Brazil helped the airline gain traction in its revenue and yield performance. But the major challenge that has plagued Gol for more than year – weakness of the BRL against the USD – shows no sign of abating in 2014. Gol also expects fuel costs to rise in 2014, further pressuring its financial results. Even with the overhang of the all-too-familiar currency and fuel cost challenges, Gol is making network changes that reflect the still tenuous environment in Brazil. It is continuing to expand its international network with a planned resumption of service to Santiago and aims to introduce service to Miami from Campinas through Santo Domingo. The airline is also receiving a cash infusion from Air France-KLM, increasing its ties to the SkyTeam Alliance. 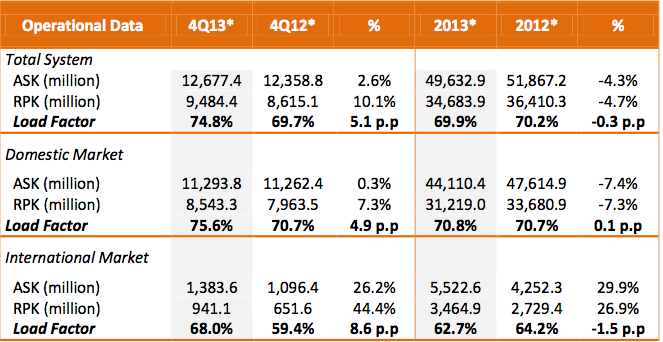 Gol’s top-line revenues increased nearly 29% to BRL2.7 billion (USD1.2 billion) and 10.5% for FY2013 to roughly BRL9 billion (USD4 billion). The carrier’s passenger revenues increased 31% and 13%, respectively, in 4Q2013 and FY2013, driven by a nearly 28% rise in unit revenues during 4Q2013 and a 18.5% increase for the full year. Gol’s yields in both periods increased 19% year-on-year. The airline attributed its strong revenue growth to a more favourable mix of corporate and leisure customers and improved revenue management. CEO Paulo Kakinoff explained that typically Gol’s business to leisure passenger mix is 60% to 40%; but presently the carrier’s corporate mix is about 65%. During the last year Gol has focussed on improving its revenue management, placing a lot of attention on the corporate sector. Gol is also in the midst of reconfiguring 80% of its fleet with an extra legroom product with the goal of featuring the offering on 100% of its domestic flights by May-2014. 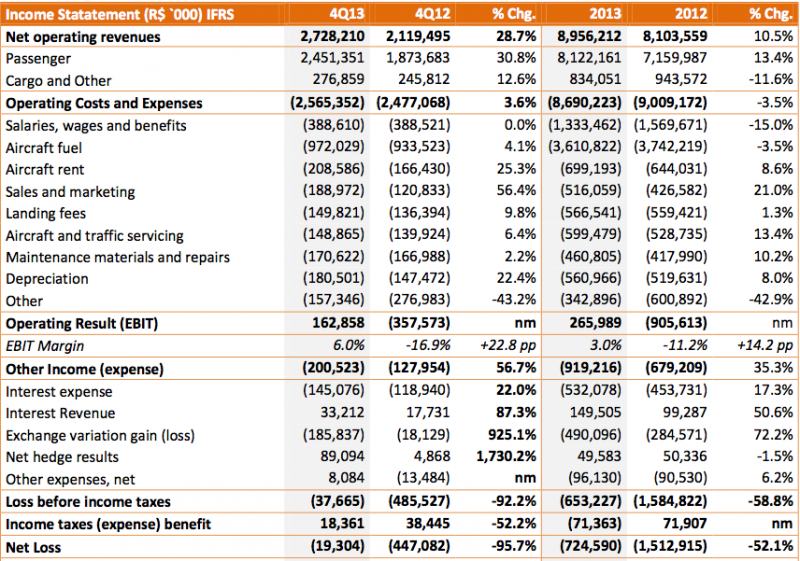 Gol’s 7.4% drop in domestic capacity in 2013 also helped the carrier gain some pricing traction to lift revenues. Its load factor for the full-year remained essentially flat at 70%, and above its estimated break-even load factor of 68%. 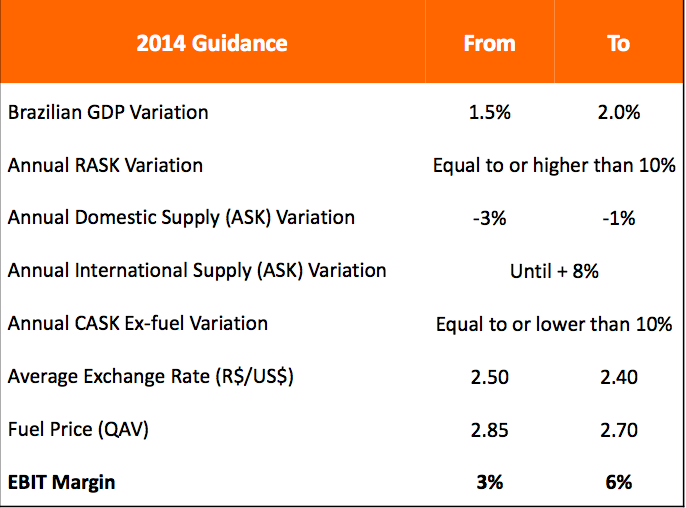 For the last year Gol has adopted a strategy of trading in load factor for unit revenue and yield growth. Mr Kakinoff said Gol has no plans of changing that mix, deeming the scheme “quite successful”. Ideally, he believes, the two metrics should grow in tandem, but for the time being Gol will continue maximising unit revenues instead of load factor. Gol’s top-line expenses fell 43% year-on-year for both 4Q2013 and the full-year while its unit costs excluding fuel remained essentially flat in both periods. For the full year the largest decline in expenses were “other expenses” with a nearly 43% reduction, and salaries and benefits with 15%. During 4Q2013 Gol’s workforce fell by 8% year-on-year to 16,319 employees as the carrier worked to increase efficiency and combat a still relatively weak domestic environment. The carrier has also taken steps to improve its balance sheet over the course of the last couple of years, and its cash position at YE2013 was BRL3 billion (USD1.3 billion), or roughly 34% of the 12M trailing revenues. Gol highlighted that in 2014 it has less than USD100 million in debt due, which gives the carrier time to “work on stretching or prepaying debt due in 2015”, which is roughly BRL673 million (USD295 million). Gol estimates that capacity in Brazil’s domestic market overall fell almost 3% in 2013 while traffic grew just 1.4%. Its own capacity within Brazil was reduced 7.4% year-on-year and traffic fell 7.3%. As economic conditions have remained weak in Brazil (the country’s GDP growth was 2% in CY2013), Gol has opted to increase its international operations, reflected in international capacity growth of 30% in CY2013 and traffic growth of 27%. In late 2012 Gol launched flights from Rio de Janeiro to Miami and Orlando through a stop-over in Santo Domingo, and it currently offers flights within Latin America to Cordoba, Rosario and Buenos Aires Ezeiza and Aeroparque in Argentina and Montevideo in Uruguay. Gol is seeking approval to launch service from Campinas, 100km north of Sao Paulo, to Miami via Santo Domingo in Jul-2014 as it expands international capacity by 8% in CY2014. Campinas is the main base for Brazilian carrier Azul, and the majority of the airport’s international service is operated by cargo carriers. Gol presently operates service from Campinas to Belo Horizonte, Brasilia, Rio de Janeiro and Curitiba. Gol should garner decent demand given that Campinas has a small international footprint. Passengers may prefer one-stop in Santo Domingo rather than travelling to Sao Paulo to catch international flights. Other international expansion planned by Gol in Jul-2014 is the resumption of flights to Santiago, Chile that were suspended in 2012 due to low profitability and high operating costs. Gol has not indicted which Brazilian markets it intends to serve from Santiago, but at one point Gol served Santiago from Porto Alegre, Florianopolis, Rio and Sao Paulo with a stop-over in Buenos Aires. Partner-friendly Gol is also expanding its international reach during 2014 through an expanded partnership with SkyTeam member Air France-KLM, which is taking a 1.5% stake in Gol through a USD100 million investment in the carrier. The stake Air France-KLM is taking in Gol follows a similar move made by SkyTeam member Delta, who invested USD100 million in Gol in 2011, and holds a seat on Gol’s board of directors. Gol has consistently maintained that it will remain independent, but with the latest infusion from Air France-KLM, the carrier is clearly becoming more beholden to SkyTeam’s largest carriers. Even as Gol maintains its independence from a major global alliance, the stakes that Delta and Air France-KLM now hold in the carrier inevitably give those airlines preferred influence over Gol’s future partners. As previously reported by CAPA, the “exclusive” partnership between Air France-KLM and Gol in the Brazil-Europe market does include a carve-out for TAP, which needs a new Brazilian partner now that TAM has joined oneworld. TAP is also adding two new Brazilian destinations in 2014, and would benefit from a partner with an extensive Brazilian network. Air France-KLM plans 9% capacity growth to Latin America in 2014, which will benefit Gol with added passenger feed. Gol also formally launched a two-way codeshare with SkyTeam member Aerolineas Argentinas in Mar-2014, to bolster competition against LATAM in the busy Sao Paulo-Buenos Aires market, which should give Gol some advantage in continuing to build its corporate share. Gol expects both unit costs and unit revenue growth of up to 10% in 2014, and is attributing most of the unit cost hike to dollar denominated expenses and further capacity reductions in the domestic market. The carrier is warning that economic conditions in 2014 could be tougher than 2013, with fuel prices rising and exchange rates remaining weak. Gol estimates an exchange rate of BRL2.40 to BRL2.50 to the USD. Exchange rates also were a major factor in LATAM Airlines Group’s loss for 2013, but as CAPA has previously reported, LATAM aims to move TAM’s debt and aircraft obligations to the LATAM balance sheet denominated in USD to eventually wipe out its currency exposure some time in 2015. Gol has no such option, and will continue to battle exposure to currency fluctuations. Gol is taking the right steps to withstand continuing pressure from the weak BRL through capacity reduction in the domestic market place and expanding its own international routes and partnerships; but the carrier has shied away from setting any definitive timeframe for a return to profitability. The carrier characterised 2012 as a year of restructuring, 2013 as getting back on track and 2014 as reaching “altitude”. But for now it seems 2014 may prove to be another year where Gol’s profits fail to take flight.